Wine is one of the pleasures of life; it should not be a competition amongst wine lovers. However, competitions are an indispensable way of validating vintners’ claims. With this in mind, Charles regularly enters and sponsors wine competitions. Charles Fajgenbaum is a Certified Grand Master Winemaker by the Wine Judges of Canada. Under Charles' guidance, you too can fill your cellar with award winning wines that have been shown to be better than many commercial wines. With his wines winning medals at provincial and national competitions, Charles has demonstrated time and again that his passion for the winemaking process delivers commercial calibre wines at a fraction of the cost of their commercial counterparts. At the Ontario Provincial Competition, pitting the best wines from over 30 clubs against each other, 14 wines made with our frozen must from Spain took medals! We entered a wine made from our Spanish grapes to get feedback from Wine Judges Of Canada. The results were great- even though the wines were young, a tempranillo/merlot blend scored a bronze medal and a grenache blanc/muscat/macabeau scored a silver. Wine writers and judges tend to think that individuals simply can't make a great bottle of wine, so we asked them to prove it. We invited a series of judges to do a blind tasting, 6 flights of wine, and we asked them to tell us which wine was not the commercially bought wine. Should be simple, right? Not so simple for the judges - check out this video that shows the surprising results! Amateur wines were pitted against commercial wines in eight categories at the 2007 GTA Open Wine Competition. The average value of the commercial wines was just under $20.00. The judging committee consisted of Courtney McMullen, Sommelier of the Royal York Hotel, Ron Speranzini of Willow Heights Winery, and Tom Ostler from the Wine Judges Of Canada. Commercial wines won only one of the eight categories. Wines entered by Charles Fajgenbaum received 3 silver and 2 bronze medals, with one wine winning its category. 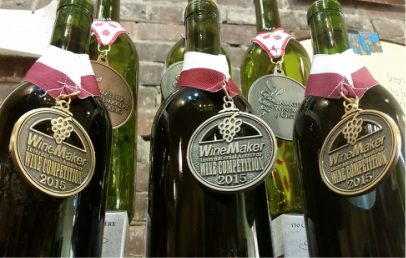 Medals are given out by point accumulation; it is not unusual for no gold medals to be awarded in a category, as it is extremely difficult to score enough points to achieve a gold medal under the Wine Judges Of Canada scoring system.